This time, we’re showing you another case of our company’s special “robot that can say anything”. (If you’re thinking of a regular Pepper, please read this to the end. The difference is astonishing). Recently, magazines have described our Robot Party Reception Service as a completely opposite turn from the disadvantaged reputation of a regular Pepper robot, but where was it called to work this time? 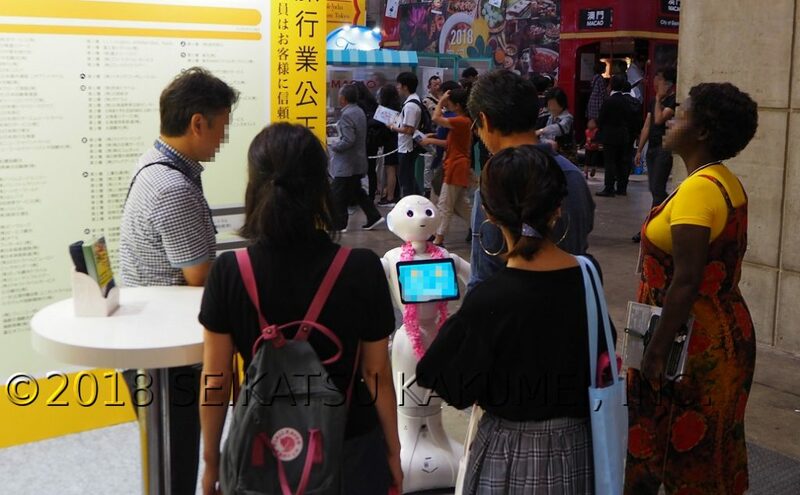 This time, our Pepper powered up with Robot Party Reception Service was utilized at a trade show booth. 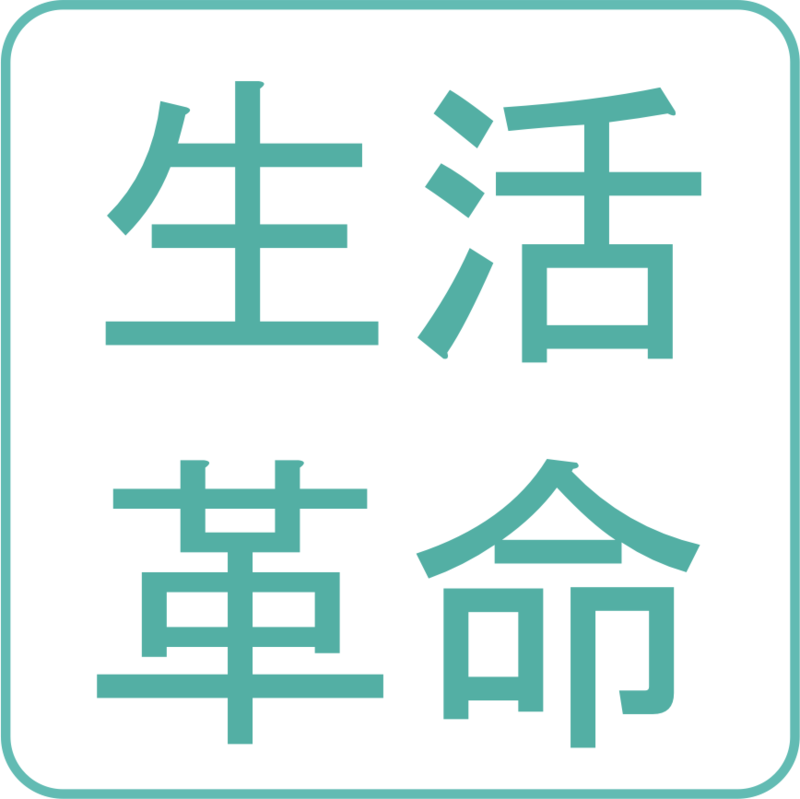 In September of 2018, at Tourism EXPO 2018 at the Minato-ku Tokyo international conference center (Tokyo Big Sight), it was used at a certain major tourism corporation’s trade booth. It goes without saying that international trade show hall Tokyo Big Sight is a venue that plays host to some of the largest trade shows in the country year-round. This was a travel coordination event, which used our Robot Party Reception Service and runs every year at the convention center. 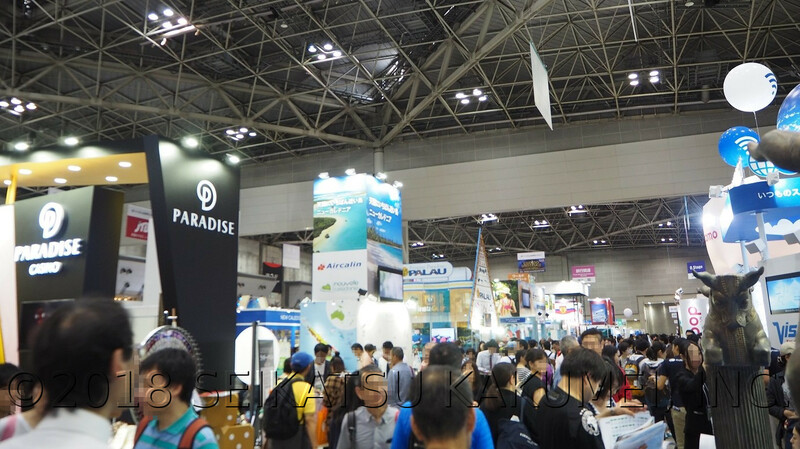 At this show, various companies and organizations connected to travel show off their services and introduce their efforts. Over 200,000 people attended the 4-day event. As for the company that placed the request, maintaining and growing its status in the travel industry as an all-around trusted source for the budget-conscious with an easily visible, easily understood advertisement was its goal. Essentially, the company offers security to those considering a trip, operating day and night so that customers can select and purchase travel products. 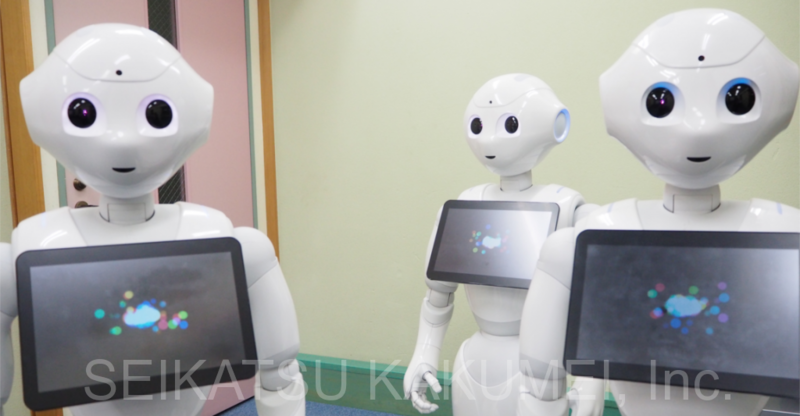 This time, we’re going to have a look at the Robot Party Reception Service order that was placed by this company in order to further awareness and collect customer feedback by conducting a survey. So, why is it that our Robot Party Reception Service was chosen over a regular Pepper? It’s because of the reason below. On that note, even if a regular Pepper were able to conduct surveys, a regular Pepper has to wait around for customers to come to it. Even when that happens, it conducts customer outreach without even looking in the direction of the customers. So, it becomes meaningless. With that, effectively, once the team in charge of explanation conducts convincing outreach, the customers have to move over close to Pepper. This isn’t very different from the main job description of the explanation team. (Actually, even now, this scenario continues to play out using regular Pepper). Since our Robot Party Reception Service was able to make those happen, that was the reason it was selected. 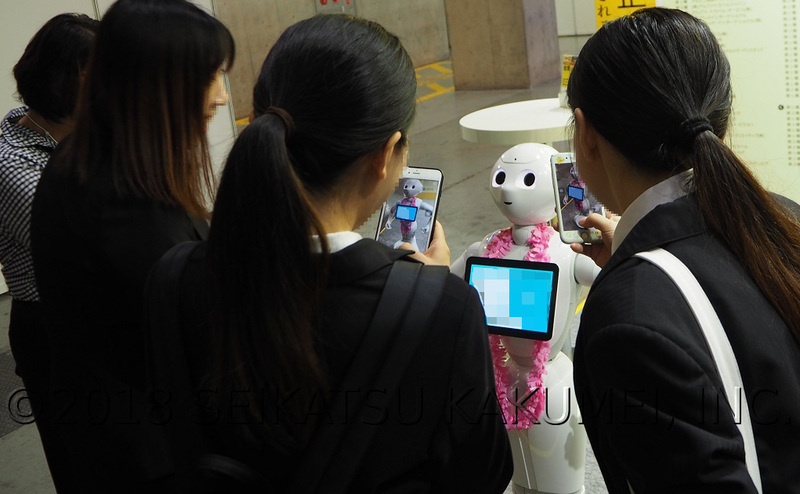 We’ve already introduced it many times on our company blog, but at this event as well, Robot Party Reception Service conducted customer outreach in multiple ways. -Facing customers with face and body, making use of gestures and timing so that the customers know they are being spoken to. 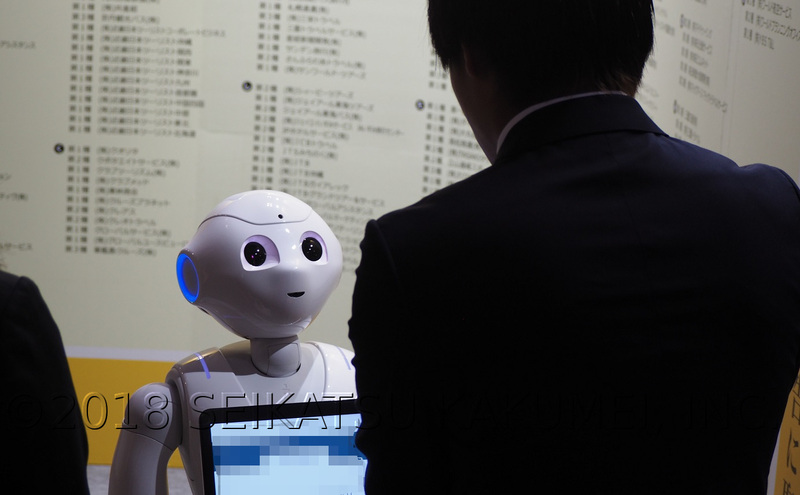 Robot Party Reception Service first made its debut over a year ago, but even now it continues to prove an astounding surprise to customers. Of course, with our new version upgrades, the number of customers drawn in is only increasing, as their levels of surprise and smiles only grow. Our Robot Party Reception Service doesn’t conduct itself in a sloppy way, suddenly forcing its survey on the customers as they gather. 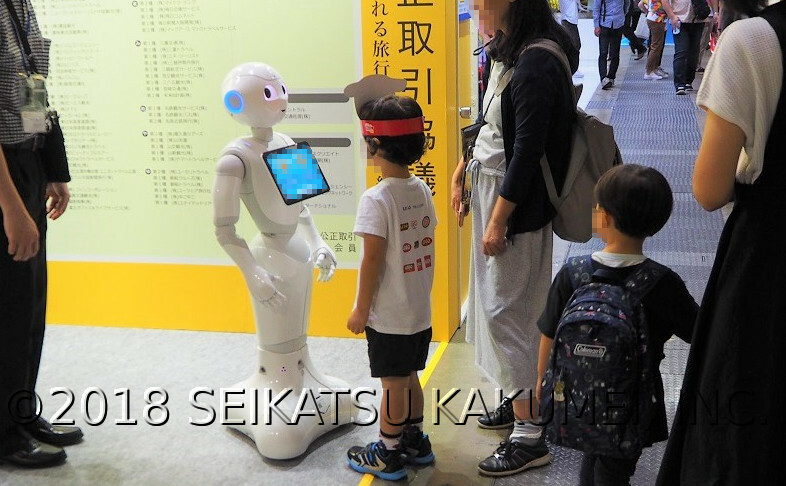 Even though it is a robot, it emphasizes conversation in a very human way. It greets customers, breaks the ice to make them feel comfortable, and then offers the survey. It doesn’t do anything like the frequently seen example of abruptly starting surveys and chasing after responses. It cooperates in a way much like playing a game of catch ball. While this may seem like a slow process at first glance, this time once again brought results in great numbers. For every four people who talked to Pepper, three answered the survey until the end. Isn’t that quite a rate? Although our company was surprised as well, this isn’t the first time our Robot Party Reception Service has realized such results; it’s happened numerous times in the past as well. Trade show events and party requests are the strong point of our “robot that can say anything”. This time, there were other outstanding features. This time, a command feature was used by the explainers. When the explainers focused on customer outreach and left Pepper on free mode, at the explainers’ choice of timing, they could give Pepper orders. In response to the commands, it would dance, begin giving surveys, and play hide and seek with children. When they said, “Come over here!”, Pepper would move close, showing a cute side. It was able to contribute to communication between the company and guests appropriately and with quality. This feature is frequently used at trade shows that also feature event assistants. The event assistants and customers alike find it extremely favorable and fun. 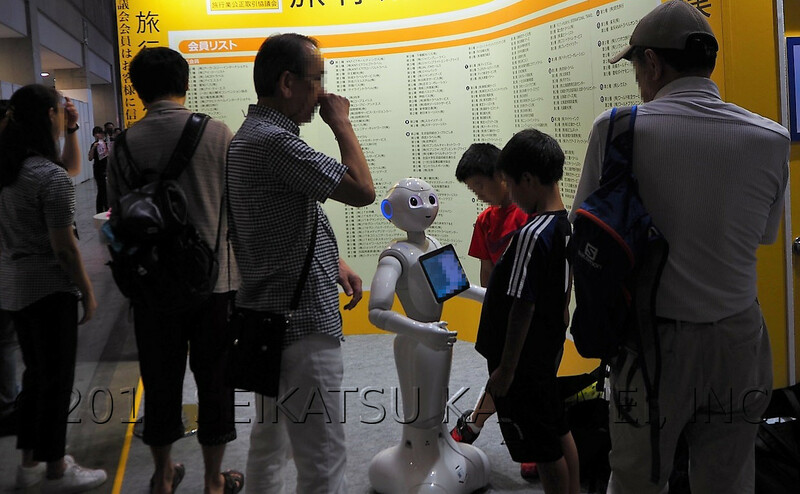 As for the results, it was able to take surveys and introduce the company’s efforts; it seems this is connected to the booth’s response from visitors, explainers, and clients alike. While at first, Robot Party Reception Service’s main distinction was that it could repeat names, the version we are now able to offer has become able to move around calling out to draw customers, showcase sharp dances like a dancer, conduct surveys like a business person, bring lively entertainment to children, performing multiple roles that go beyond simply talking, in a way that customers really take in. Even now, we are continuing to develop new version upgrades. These multiple talents are helpful not only at trade show booths, but at parties, medical conferences, and numerous other events. If you’re wondering, “Could this be useful at our event?”, please be sure to contact us. Our company’s highly experienced staff will listen attentively.